terests include Jainism, Hindu goddesses and Indian cinema. Her first book, At the Feet of the Goddess: The divine feminine in local Hinduism, was based on fieldwork in Orissa and Tamilnadu. Stuart Abbott is a Visiting Lecturer at University of Wales, Newport and an Associate Lecturer at Cardiff University. His research interests include Tantrism and Kashmiri Saivism. 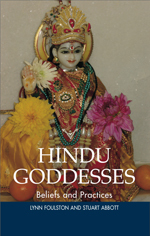 This book explores the diversity of Hindu goddesses and the variety of ways in which they are worshiped. Although they undoubtedly have ancient origins, Hindu goddesses and their worship is still very much a part of the fabric of religious engagement in India today. Hindu Goddesses: Beliefs and Practices offers an introduction to a complex and often baffling field of study. Part I, Beliefs, provides a series of encounters with a range of Hindu goddesses starting with the idea of ‘Goddess’ as a philosophical concept. Topics include textual evidence for belief structures, goddess mythology, and the importance of ‘the Goddess’ in Tantrism. Part II, Practices, leads the reader through the tangled web of goddess worship, pausing along the way to examine the contrast between temple and local worship, the splendour of festivals and the importance of pilgrimage to those places in India where goddesses are considered to reside. A Conclusion provides details of contemporary developments in goddess worship, such as the appearance of new deities who supply the needs of worshipers in the twenty-first century. Who or what is a Hindu goddess? Goddess worship – a legacy from the past? This is a lucid, wide-ranging book that offers a comprehensive overview of the major beliefs and practices associated with Hindu goddess traditions. Lynn Foulston has done a masterful job bringing together a broad range of scholarship on the Goddess and making the material accessible to a general audience. University students in particular will find the book very useful. This rich overview of goddesses’ role in Hinduism addresses goddesses as manifestations of Shakti, the elite philosophical position most often discussed in treatises on Hinduism, and from a popular perspective, as individuated beings, which is the ‘religion as lived’ perspective of the majority. Foulston and Abbott cover both pan-Indian and local goddesses and traditions. Significantly, this volume is split evenly between beliefs and practices ... Part 1, on beliefs, includes a blessedly clear discussion of the feminine divine in India’s philosophical traditions, detailed discussions of the goddesses as they appear in all of the major Hindu texts, and summaries of goddess mythologies including selections from local oral traditions. The chapter titled ‘Tantrism and Hindu Goddesses’ is an excellent summary of the topic. The authors balance national and local traditions when discussing practices. Part 2 covers festivals, devotional practices, meditation and yogic practices, tantric practices, pilgrimages, and explanations of sacred sites and sacred objects. Hinduism is a living tradition, and, appropriately, the final chapter discusses new goddesses and practices. Highly recommended. Foulston and Abbott explore the diversity of Hindu goddesses and the variety of ways in which they are worshipped. In the first part of the book, the authors provide a series of encounters with a range of Hindu goddesses, starting with the idea of ‘Goddess’ as a philosophical concept. In the second part, readers are led through the tangled web of goddess worship, and shown the contrast between temple and local worship, the splendour of festivals, and the importance of pilgrimage. A conclusion examines contemporary developments in goddess worship, such as the appearance of new deities. Assuming no prior knowledge of the subject, this book should interest undergraduate students and anyone wanting to know more about the religions and philosophy of India.